Cornwall Council today voted overwhelmingly to support a proposal to lobby central government to amend the Parliamentary and Voting System Act 2011 to ensure that a cross-Tamar ‘Devonwall’ parliamentary seat is not created through the present Boundary Review. The proposal came from a motion that I had previously tabled to a meeting of Full Council, but had been reworked by officers and councillors through the Constitution and Governance Committee. Opposition to the motion came from the former leader of the Conservative group, Fiona Ferguson, who made a couple of unwise comments. I will blog more about this when I can get the exact quotes from the webcam. It looked to me that about ten Conservatives opposed the proposal and some also abstained. 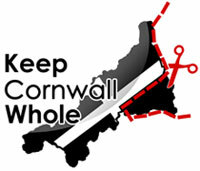 (c) It is inconsistent with the spirit and intent of the said Framework Convention and its application to the protection of the Cornish that the implementation of the current parliamentary constituency review in accordance with the provisions of the Act would lead to the territorial integrity of Cornwall and its historic boundary being compromised. (3) that the Leader seek an urgent meeting with the Boundary Commission for England to raise the fundamental constitutional issue of the integrity of Cornwall’s boundary and the impact of the said Framework Convention that is critical to the effective implementation of the said parliamentary constituency review.